One of the best ways to share the Gospel with kids is the wordless book. It’s a series of colors that can be used to explain the Gospel. I was surprised to learn that many believe that Charles Spurgeon originated the wordless book idea. Later is was used by several early Evangelical Missionaries. You can find a good summary of it on Kidology and read about it’s history on Wikipedia. 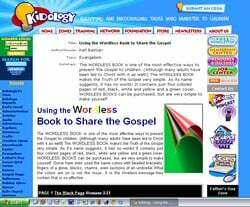 Do You Use The Wordless Book? If you have used this approach to sharing the Gospel with children, then leave a comment below. Let us know what setting and how it turned out. Have you seen many children come to Christ through this explanation? Tony Kummer (Editor) reviewed & updated this page on : January 18, 2011 at 8:31 am. All our content is peer reviewed by our readers, simply leave a comment on any post suggest an update.